Discussion in 'Downhill & Freeride' started by CraigS, Jul 23, 2013. I own a TLD D3 and want to upgrade my goggles but not sure of compatibility. Currently considering Oakley Crowbar or Mayhem or Smith, just not sure which fits the best with the D3. None of my local shops carry goggles so I'm not able to try any out. just my opinion but smiths have the worst (or shortest lasting) anti-fog coatings of my goggles. i've owned oakley, smith, scott, and Eks Brand. i like the crowbar, the outrigger arms make it compatible with a wide variety of helmets. go mayhem if you wanna run canister-type roll offs. granted they used to sponsor me, but EKS make a pretty good underrrated goggle. generic in appearance, but the frame is ultra flexible. along with good sweat wicking foam, it seals great. easy to run canisters or tear offs. fits my D3 well. and they're on the cheaper end of the pricing spectrum. These do the trick for me. while were on the subject of goggles, does anyone HAVE to wear glasses while DH'ing? 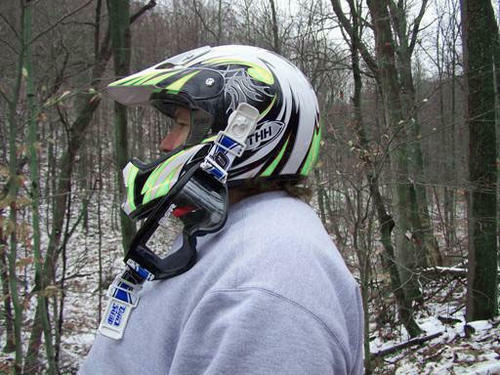 i always used quik strap for when i used to ride dirt bikes.. id imagine id like them just as good for mtb?? I have a D3 as well. From experience the Mayhem fits pretty darn good. I also have a Scott Tyrant and it fits even a bit better. I highly recommend the Tyrant. Theyre on sale everywhere from like $30 or something. Also a plus is it has a feature that changes the profile of the lower part of the frame to make it fit better. It works. 4 settings, the Scott Hustle has this feature as well. All Oakley models seem to work awesome with my D3. I've used Crowbars, Mayhems, and now the Airbrake MX. Admittedly, my eyes aren't that bad, but once I started wearing contacts lenses it was like night and day. Whenever I've worn glasses riding since then, I end up with different planes of trail. I would ask your optometrist for some samples to wear while you're riding and see how you feel. I got contacts for riding, and now where them daily. I've really enjoyed the Crowbars on my D2 and now my D3. Moreso on the D3. I liked the slimmer Spy Targa(or was it Alloy) with the D2. while were on the subject of goggles, does anyone HAVE to wear glasses while DH'ing? I can't see my handlebars without my glasses, so they're pretty much mandatory. I have Scott OTG goggles, they're cheap, and they fit over my glasses just fine, where most goggles don't, and they last longer than any of the high end goggles I've used in the past. To the OP, have any Moto shops in the area? Take your helmet and go try on goggles. Never seen a bike shop with half the selection of even a lame MX shop. ive already tried contacts, twice. my optometrist only lets me 'try' one type of contact (he says this certain type is best for my eyes), and they dont stay in my eye. any time i go to do a 360 or a 540 on the DJ they'd pop out and id lose one or both. cool, ill have to look into those..
100% racecraft is a perfect fit. They look great too, and are very well made. I wear large frame glasses because I hate seeing the rim, and because chicks dig a guy in Ray-Bans. You mite be fine with regular Scotts, that's what I used to wear when I had smaller spectacles. Tried contacts, hated them. Next step is Lasik, but until then, it's all about the OTGs.